Metal braces are by far the most common type of fixed orthodontic appliances—and for good reason—they’re a proven, affordable, and time-tested way of aligning a patient’s teeth. Generally made with high-grade stainless steel, metal braces consist of small metal brackets that are cemented to the front surfaces of the teeth. A thin, metal wire – referred to as an archwire – runs through the brackets and puts pressure on them. Because the brackets are fastened to a patient’s teeth, the archwire will cause the teeth to gradually move. This process will actually reposition the teeth into a better spot. Over time, the teeth will follow the shape of the archwire. This archwire can be fixed to the brackets using metal ties, flexible elastics, or other types of clasps. 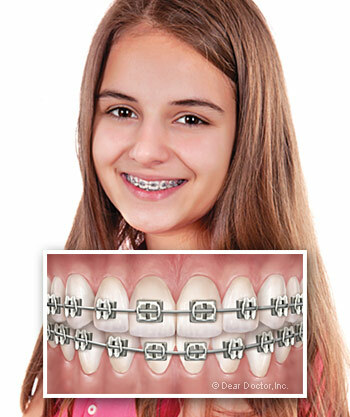 Ceramic braces, or clear braces, are a variation on traditional metal braces. Ceramic braces offer a far more discreet appearance during orthodontic treatment due to the brackets being made of a translucent ceramic material. This material blends into the tooth’s natural color, making this type of braces a favorite for adults and those who don’t want to be seen in traditional braces. While the ceramic brackets provide a better aesthetic appeal, the brackets are less durable than metal brackets, which could affect overall treatment time. Ceramic braces may provide a more discreet orthodontic treatment, but lingual braces offer an invisible treatment! Lingual braces are special appliances that are placed on the interior of the teeth. They work the same way as metal braces do, only they can’t be seen because they’re placed on the other side of the teeth. Lingual braces aren’t the right treatment for every orthodontic condition and they’re more expensive than standard braces, but if you want the least visible type of fixed braces, this option is the way to go. Visit Your Lansing, Meridian Township , and DeWitt, MI Area Orthodontist! If you’re interested in any of our orthodontic treatments, or Invisalign, we encourage you to come in sometime for a free consultation. To schedule your free consultation, you can fill out our online appointment request form or give us a call at (517) 507-3001. We hope to see you soon and look forward to helping you attain a straighter smile!